March 1, 2011 – I had a chance to talk to Head Coach Coach Chris Stroud of Destrehan and get an update of some of his players that could still sign for this past 2011 recruiting class. MLB Tarquin Kenner (5-10, 240) who runs a true 4.6/40 and looks 4.5 in the 40 in full pads is still being recruited. I loved watching this kid play the past three years. He always gave great effort and is a football player. Kenner is still trying to decide between Central Arkansas and Nicholls State if he gets his grades in order in time for the fall semester which he has a great chance to do or Junior College. Kenner could start for any IAA college if there’s a need at MLB right away. If he goes Junior College he will be heavily recruited again in two years. Kenner reminds me of a taller version of former New Orleans Saints LB Sam Mills who was 5-9, 225 pounds as a LB in the NFL several years. Athlete DeAnte Armstrong (5-7, 155) who looks 4.3 in pads, but runs a 4.5/40, has a ton of upside as a Slot Back WR or Special teams Punt or Kick Returner. He is still trying to decide between Lambuth College or taking the Junior College route. Lee Brecheen, is the owner and publisher of La, Football Magazine and TV show. He is relentless in his pursuit for excellence. He initially broke into the business in 1992 as a football scout. It is his intent to be fair and honest to all high school players and coaches in Louisiana. Lee strives to be the most thorough and accurate researcher and analyst in order to give the best evaluation of all Louisiana high school football talent. 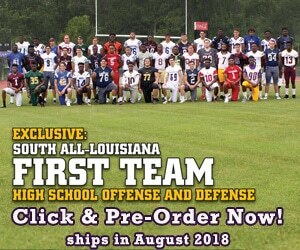 He regularly consults with, and is sought by major college football programs throughout the country for information and advice regarding scholarship prospects from among Louisiana’s high school players at all levels of potential.